In May of 2009 I went on a journey; a long, almost daily, journey that involved a bunch of thought provoking reading and thinking. Last week, May of 2011, I completed a journey every believer should take when I read the Bible from front to back, just 2-3 chapters a day, underlying key words, phrases and verses all along the way. And these are my simple, non-theologian thoughts on this amazing book. Certainly throughout my life I have read every book of the Bible and many Christians have read God’s word through the “One Year Bible” method. But honestly, after years of reading and loving God’s word, I realized I had never truly read it like a novel; starting at page one and reading until the end all the way through. Add taking the time to read it slow and highlight various aspects to each verse, and it’s a journey that can take a while. After a business tragedy hit my family in May of 2009 God laid it on my heart to get into His word for strength, peace and comfort. I wasn’t sure how books like Leviticus would do that, but frankly one of the key verses I discovered in this process came right out of that book! God is always full of surprises. Now I know there are thousands of people who have spent their life studying the Bible – breaking it down into every small detail and part imaginable. Theologians, Pastors, Bible scholars, and even Bible critics have all spent much more time than I have for sure in such study. But the thematic breakdown for me was quite simple. The Bible is a collective play of many stories depicting the stubbornness and ill ways of Man within the back drop of the grace and judgement of a holy God. It just doesn’t get much easier than that. Really. Man continues to think he has it all figured out…turns away from God in pride and sin….something tragic happens in which Man needs God to bail them out….God comes to the rescue…Man turns back to God out of thankfulness and the cycle repeats over and over again. Over the last two years this repetitive story line was always right in front of me, from Genesis through Revelation. In the end we can only be the best God made us to be by realizing that without the Creator we are doomed to be the above. All God wants is for us to ask forgiveness, never forget Him, be thankful for all He has and continues to do, and live a good life as a way of showing Him how much we care. Like the ones before me, I am far from doing all of the above. Without His grace I would be certain for Hell. 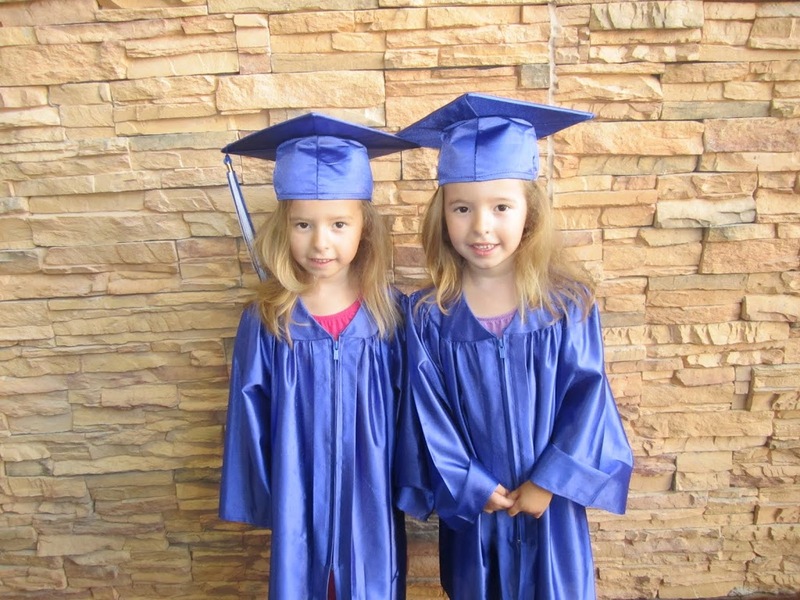 Sidney and Chloe strolled across the stage Wednesday morning as new pre-school graduates of Ridge Kids…provided by our church Walnut Ridge Baptist. In a neat little ceremony the girls got to dress up in cap and gown, sing a few songs, and watch a wonderful slide show of them and all their friends. As Julie and I watched together, me with video camera in tow of course, we couldn’t help but both get a little emotional. Our little girls were already saying goodbye to one of their childhood phases. They are officially no longer our little “babies”. They are now our big, yet “little girls” – and oh how proud they are! In just a little over 90 days we will be walking our babies into their new “big girl school” right down the street as they start the next phase of Elementary school. At least this time, the next graduation phase isn’t for another 7 years. It just scares me when I think about how fast the last 6 have gone! In 2005, God chose to bless us with these two little girls. It’s now our job to parent them up for this crazy world we all live in. It’s a chore, nights can be sleepless and money is always tight, but we certainly wouldn’t have it any other way! This world has lost another amazing person as Dr. Kim Duk Whang, one of the pioneers of international adoption, died this week at the age of 96. In 2008 Julie and I flew to South Korea to meet the people of Eastern Social Welfare Society, an orphanage in Seoul, and to bring home our son. Dr. Kim took the time out of his busy day running numerous aspects of this large organization to speak to us and to tell us about his heart for the needy and his love for children. Sitting in his office that day hearing him share his story and his vision for the future was awe inspiring and humbling. He even signed and game us a personal copy of a book he wrote about Christianity in Korea. If only we could all be half the man Dr. Kim was our world would be a better place. Because of this man we have a son. Because of this man thousands and thousands of children around the world have families and parents have children. Dr. Kim loved on orphans and built an organization that will continue this service to mankind and God for decades to come. He was an advocate for children like one this world has never seen. Do doubt this man fulfilled his calling and did a job “well done”. His reward will be great. I will never forget standing in the playground grade school at Green Elementary when the Shuttle flew across right across the school on the back of a 777 during a landing at Ellington Air force Base in South Houston. We all froze and watched in amazement at this incredible space bird sitting piggy-back atop the largest airplane known to man. It was so low it was like I could touch it. Growing up in Friendswood, Texas, a small town about 3 miles from NASA, I heard about the Shuttle nearly every day. The entire area was alive with NASA news all the time and many in our social network had someone that worked in relation to the space program. Today the next to last Shuttle mission started and the last one is set for July, which will end nearly 30 years of voyages to “infinity and beyond”. I know Houston has to be a little sad today. A chapter in space flight comes to an end and for many of us, it has been apart of us most of our lives. Who knows what the next phase holds but I’m sure when the next vehicle to space is developed, Houston will play a vital role. And we all will watch in all just like we have for the Shuttle. Goodbye Shuttle and thanks for the memories!